Villa Atchara Karon Beach, Hotel Thailand. Limited Time Offer! Villa Atchara. Hotel "Villa Atchara" has 3 stars. 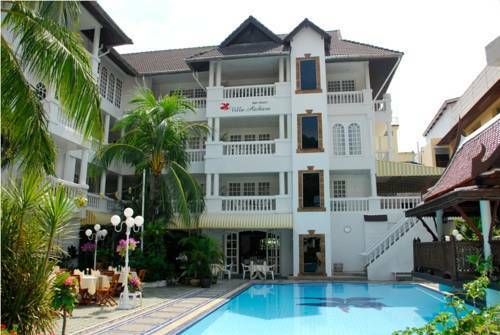 This residence is a perfect base point from which you can discover Patong Beach. The temperature of the bedrooms is never too hot thanks to the relieving air conditioning. This hotel provides its visitors with a private garden as well as a pool. Dinner can be enjoyed at the onsite restaurant which is known for its international and Thai specialties. This accommodation has also an onsite bar. In the morning, you have the opportunity to enjoy the hotel's breakfast. Internet access is available at no extra charge and there is a shuttle bus to help visitors get around more easily.